Utilizes a unique, high-strength Fabric, boasting excellent abrasion resistance, these thinly designed yet highly insulated pants (enclosed in Thinsulate™) will protect the seat and knee areas, which are vulnerable to chilling. 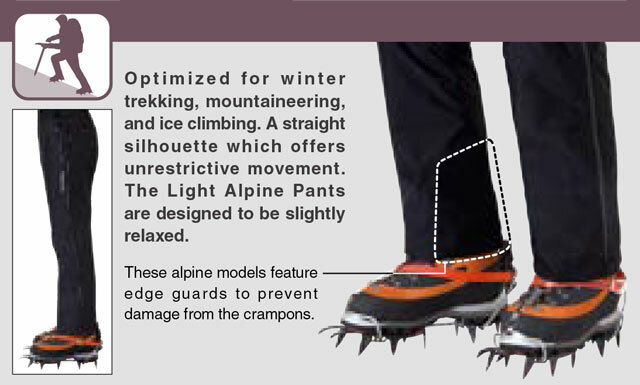 Built for harsh winter conditions such as alpine climbing. The Men's model is designed with a slim silhouette to optimize mobility and avoid flapping, while the Women's model has an appropriate amount of comfort to allow for bending and crouching with minimal tightness. GORE-TEX fabrics are perfect for highly aerobic sports that require the ultimate in waterproof / breathable technology. 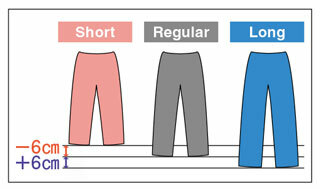 GORE-TEX fabrics are available in 3-layer and 2-layer constructions. With a 3-layer construction, a fine nylon mesh is bonded to the interior surface of the garment to protect the GORE-TEX membrane from abrasion and dirt. 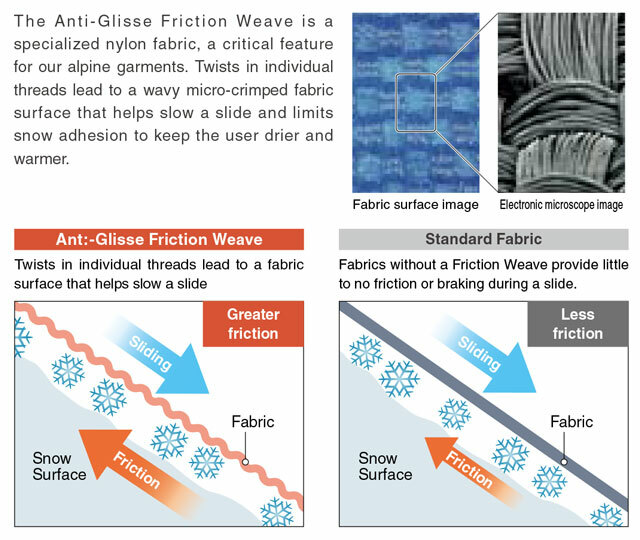 With a 2-layer construction, a thin mesh or other fabric is sewn inside the garment but is not bonded to the GORE-TEX membrane.